Princess Juliana International Airport serves the Dutch part of the island of Saint Martin. The airport serves as a hub for Windward Islands Airways and is the major gateway for the smaller Leeward Islands, including Anguilla, Saba, St. Barthélemy and St. Eustatius. It is named after Juliana of the Netherlands, who was crown princess when the airport opened. The airport runway is right next to the beach. 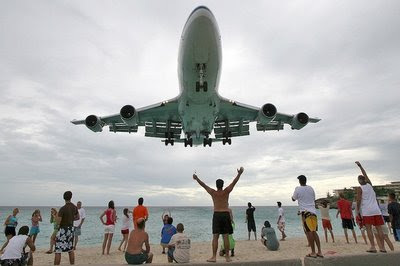 The web site has some amazing photos of planes that look like they are just a few feet off the ground flying over the beach as they come in for a landing. The world's shortest flight takes an average time of just 96 seconds and covers a little over a mile from Papa Westray to Westray in the Orkney Islands. A local ferry service form Papa Westray to Westray in the Orkney Islands was suspended recently, meaning that six teenage children had no way of getting to their secondary school, Westray Junior High. Thankfully, Loganair came to the rescue and are taking the children to and from school on what is believed to be the world's shortest flight. The flight takes an average time of just 96 seconds and covers a little over a mile. The route is popular with visitors to the islands but is also an important lifeline to residents. World's Funniest Airport Names: rudest, weirdest and strangest from skyscanner. How about Useless Loop Airport or Wagga Wagga Airport? There are some pretty strange names here. Daily Flights Viewed From Space from TravelMole. 24-hours observation of all of the large aircraft flights in the world, condensed down to about 2 minutes. From space This is a 24-hours observation of all of the large aircraft flights in the world, condensed down to about 2 minutes. From space, we look like a bee-hive of activity! You could tell it was summer time in the north by the sun's footprint over the planet. You could see that it didn't quite set in the extreme north and it didn't quite rise in the extreme south. Svalbard - Longyear Airport is the most northerly airport in the world with scheduled flights. It is located in Longyearbyen, Norway at coordinates 78°14'46"N, 15°27'56"E at an elevation of 34m (111ft). It has 1 Passenger Terminal, 1 Cargo Terminal and 3 Aircraft Stands. Here is some tourist information for Svalbard in case you want to visit. There are several airports that purport to serve specific cities but are much farther away than you might like. This airport, which also "serves" Barcelona, is about the same distance from the city as is Barcelona Girona. You'll have to drive about 68 miles from this airport if your destinatin is Hamburg. Want to ride the London Eye? 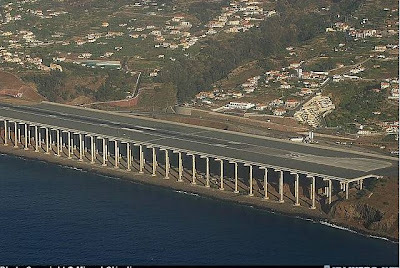 If you fly into this airport you'll still be about 60 miles away. Rival hub London City Airport has critisied the International Air Transport Association's decision to designate this airport, which is about 50 miles fron London, as a London airport, saying that it is misleading to foreign travelers. If you are traveling to Munich for Octoberfest, flying into this airport will only get you within about 67 miles of your destination. Flying into this airport will only get you within about 75 miles of Norway's capital and its museums and fjords. This airport, in Doncaster, is about 40 miles from Robin Hood's territory of Nottingham. This airport is located about 66 miles southwest of the capital of Sweden and its terracotta buildings. When you land here you still have about 45 miles to go to get to Tojyo.